I try to keep things as simple as i can and this time of the year is perfect for baking bread. 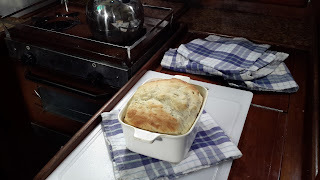 Because I follow the sun, it is usually too hot to use the stove, let alone the oven, but the outside temperature is about 80 degrees Fahrenheit so the dough will rise okay before you cook it, and the inside of the boat doesn't become so uncomfortable that you have to leave. I first mix the yeast with 2 cups of warm water and let it stand for a few minutes. The water should be warm and not hot. Then add this to 3 cups of flour and mix. Leave this to rise for an hour or so and then nead and transfer to your loaf pan to rise again. You can either buy a non stick Teflon coated pan or smear butter on the bottom and edges of your container. Preheat your oven to 400 degrees Fahrenheit and then cook for 30 minutes. The 3 cups of flour and 2 cups of water along with the yeast is all you really need to make bread, but if you want to add a pinch of salt and a teaspoon of sugar along with herbs and spices, you can. Above is an Italian herbal loaf that i had for breakfast along with my coffee this morning. Yummmm! Also when cooking with gas, I find you have to insulate the pan somewhat in the oven, so that it doesn't burn on the bottom.